The soft and minimal upper provides very comfortable next to skin feel, based on most reviews. The Hitogami 2 is reasonably-priced. It is very light and flexible. A good number of runners loved the adequate ground perception provided by the shoe. Despite the 9mm heel offset, a handful of comments noted how they run lower than the considerable drop. It works fine as a race day shoe or as a lightweight trainer. The mesh and the Intercool ventilation in the sole translate to a very breathable shoe. Traction is superb in the 2nd instalment of the Hitogami. Some runners found the ride as too hard. There were several who needed break-in time in this shoe. A few were disappointed by the upper quality of the Wave Hitogami 2. The Mizuno Hitogami 2 is a shoe built for tempo runs, marathons, or high-mileage training. With a very stable ride for a lightweight shoe, runners can also pick up the pace because of the responsive forefoot and the smooth transition from heel to toe. The Mizuno Wave Hitogami 2 has not disappointed me at all, it has been a major improvement on the first Hitogami which has been one of my favorite shoes. It is a shoe that is able to perform well from short distance 5k races to longer races above 20km. The original Hitogami was the first Mizuno I ever owned. I was genuinely blown away by how well it performed as a shoe, having never worn a racing flat before. Even as a racer, the first Hitogami performed well in training and in competitions. More importantly, the second Hitogami just made an amazing shoe even better! The thing that I feel is the real selling point on the Hitogami 2 would be the upper. The upper is soft and breathable and it does not restrict my foot movement. Having a wide foot, the ability of the mesh to stretch is greatly appreciated. Besides being able to stretch, the upper is also super breathable. I do care about upper breathability as I live in Singapore which has a very hot and humid climate. Also, I have been able to run in this shoe without a sock (not recommended) as the upper does not cause any discomfort. I do feel however, that the mesh breaks easily on both iterations of the Hitogami I own. The mesh has a tendency to break near the toe box after 150km which has happened on the three pairs of Hitogami I have. The U4iC foam used in the midsole is in my opinion a very comfortable one. Being a racing flat, I didn’t know what to expect from the midsole. Surprisingly, I haven’t had any problems with the U4iC material. The material has provided enough cushioning for me to be able to train for long periods without experiencing any discomfort. On the other hand, the wave plate found in the back part of the shoe is more of a love hate relationship. I love the wave plate as it gives the shoe firmness and responsiveness while doing faster workouts. On the other hand, I sort of dislike the wave plate as I feel that it adds unnecessary weight to the shoe. However, I feel that this problem should not stop someone to not get this shoe. Mizuno’s x10 rubber compound has been one of my favorite rubber compounds. The x10 compound Mizuno uses has performed well consistently on many surfaces and even on mild trails. The rubber is super grippy out of the box and stays that way till the shoe is retired. After roughly running 300km on the shoe, the sole has not lost much in terms of traction. However, the shoe has been struggling on wet surfaces recently. Aside from that, I have not really faced any problems with the rubber. Although the heel drop on the shoe is 9mm it does not feel like a 9mm drop but something lower. Because the shoe has a seemingly low heel drop, running in this shoe has been a joy! A shoe which has a similar heel to toe offset is the Adidas Boston Boost which has an offset of 10mm. Although the offset on the Boston Boost is only 1 mm more, the difference is very significant. The heel cup is one feature that I love about this shoe. The heel cup on the shoe fits me nicely, which surprised me as I normally have a lot of room in the heel cup of other shoes. Because the heel cup fits so well, I have not received any hot spots while running in this shoe. The laces on this shoe has been a big improvement from the ones on the first shoe. The laces on the first Hitogami didn’t hold well during runs. The ones on the hitogami 2 do not have this problem which I appreciate. Being someone who cares a lot about the looks of the shoes I run in, the design of the shoe is very unique. The wave like patterns on the shoe makes the shoe stick out, especially on the black red colorway my shoe has. I feel that the Hitogami is suited for the runner who wants a shoe which they can wear out casually. The Hitogami is a shoe that I would recommend to anyone who needs a fast and responsive racer that is versatile enough to be used for training sessions. The Hitogami is a shoe that does not have a break in period and has been performing at the same level ever since I started wearing it. However, it is good to note that the upper is not very durable and may break prematurely, but it is still a very comfortable upper. Besides the upper breaking prematurely on both of my shoes, I have not faced any other problems with this shoe. One other thing I would like to add on would be how comfortable the sockliner is. While running in the shoe, I had no hotspots whether I was wearing a sock or not. The Mizuno Wave Hitogami 2 is a shoe that for its price point performs exceptionally well. The shoe has been my go to racer for many of my road races as I know that it is able to perform well. Being a shoe that I like so much, I would definitely recommend it to any runner who wishes to buy a light and responsive racer that can also be used in training. I think this is a lightweight shoe that will be a very successful all-around shoe for most everyone. If you like a firm, speedy shoe, the Hitogami is a great workout option or marathon racing flat. Mizuno brings several changes in the 2nd edition of the Hitogami to improve the solid performance of the original model. In this version, the Runbird logo is now stitched on and serves as the main overlay. Besides the logo, there is a midfoot overlay just beneath the mesh to enhance the support and midfoot lock down. A nice touch that helps with the transition is the design of the forefoot. It is more curved for better toe spring and flexibility when taking off. Lastly, the inner lining in the shoe is very soft, which is one of the reasons why it is very comfortable for fast-paced runs or high-mileage sessions. Mizuno recalls the fit of the earlier model in the Hitogami 2. An improvement, despite the removal of several overlays, is the midfoot security. It really holds the foot down. As the forefoot is slightly more curved, it also becomes a hairline smaller, but good enough for the toes to splay. Medium to narrow foot dimension is expected to fit in just fine. The sizing runs true in this shoe. A G3 outsole is the main component in the Hitogami 2’s underfoot. The rubber treads are fairly regular and almost flat with deep flex grooves for flexibility. 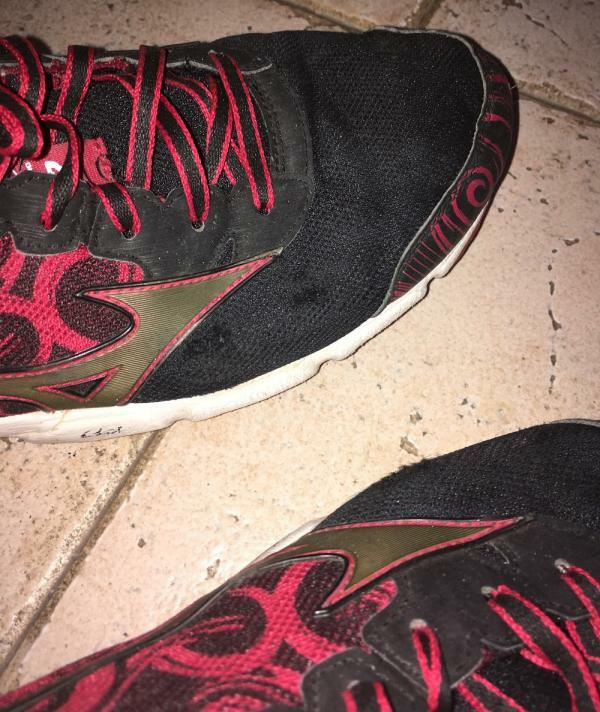 As with most Mizuno shoes, there is a midfoot cut that shows a glimpse of the Wave Plate. A segmented crash pad helps with the shock dispersal and is covered with the X-10 compound like some parts of the forefoot. The midsole is where the action really happens in the 2nd coming of the Hitogami. Mizuno places the Wave Plate between two slices of the U4iC midsole foam. The upper foam is found in the heel and the forefoot like the Wave Plate while the lower portion runs the entire length of the shoe. This arrangement creates the firmness in the ride and the noticeable responsiveness in the forefoot, which greatly helps in picking up speed. Intercool ventilation ports are scattered throughout the sole for enhanced breathability. This midsole technology is also present in the Hitogami 4 and Inspire 15. An Airmesh upper allows air to flow freely for a really well-ventilated run. There is a soft overlay under the mesh that helps the stitched on Runbird Logo to hold the midfoot. Inside the shoe is a very soft lining for excellent skin feel. To give a little cushioning, Mizuno provides plush insole.